I love cleaner wrasses. If you look carefully around when you spot them, you very often find one of their “customers” ready to be cleaned. In this occasion, the goatfish changed colour and started hovering vertically, opening its mouth. That was the signal the wrasse was waiting for. 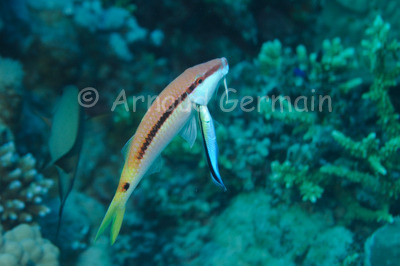 On this picture, you can see the wrasse cleaning the inside of the gills of the goatfish.